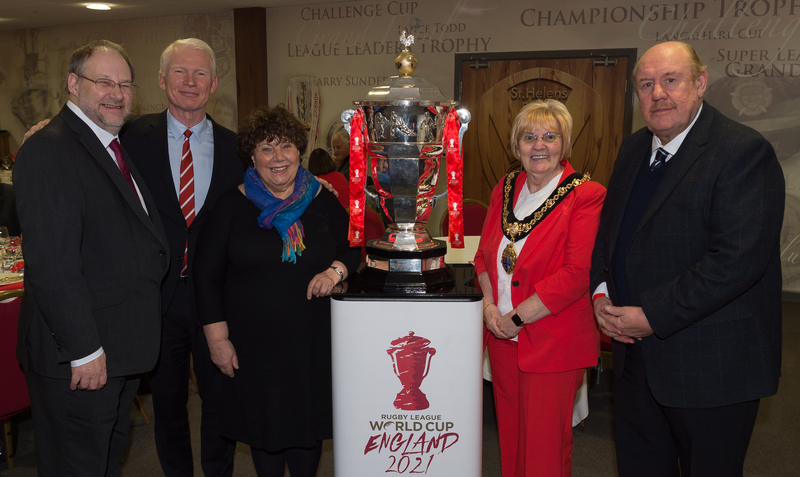 Key dignitaries of the borough have welcomed the announcement that Saints’ Totally Wicked Stadium will host three men’s group matches at the 2021 Rugby League World Cup. The 18,000 capacity stadium – considered by many to be the best purpose-built club rugby stadium in the country – was confirmed on Tuesday (29 January) as one of 21 venues across the country to showcase the 2021 tournament which organisers are tipping to be the biggest one yet. St Helens Council Leader Derek Long – who made a successful bid a priority in his very first week in office as council leader; and MP for St Helens South & Whiston, Marie Rimmer – who was influential during her time as St Helens Council leader in getting the state-of-the-art stadium off the ground – were among those in attendance at yesterday evening’s Super League opening round clash between Saints and Wigan Warriors as the news was announced in front of a packed crowd. “I can’t wait! Two more matches than 2013 for fans to enjoy! This shows how far the borough has progressed in competing with 36 venues across the country. Our hosting could, not only bring in £3.6m to the local economy, but provide the springboard to develop our fantastic rugby league roots. Although he couldn’t be there in person yesterday evening, MP for St Helens North, Conor McGinn, has also spoken of his delight that St Helens will be part of such a showpiece event which will support other strategic initiatives such as the St Helens town centre regeneration and raising the profile of the borough. Mr McGinn said: “It is great news that St Helens has been chosen to host three games at the 2021 Rugby World Cup. It’s testament to the hard work of Eamonn McManus and everyone at Saints, supported by St Helens Council and the entire local community. The influence of the world cup coming to St Helens is expected to boost St Helens’ economy by around £3.6m, and benefit the local grassroots game through a number of legacy projects. While the tournament will also look to enhance health and wellbeing initiatives, as well as encourage more people to take up sport and get involved with volunteering opportunities which were all strong aspects in St Helens’ highly commended bid. Brian Barwick, Chairman of both the RFL and the Rugby League World Cup 2021 was also in attendance last night. Initial discussions with tournament organisers resulted in the possibility of the borough also hosting a national team throughout the duration of the World Cup, using Ruskin Drive Sports Village and Saints’ training base at Cowley Language College as training bases. A decision on this is still to be made. To be held in England in the autumn of 2021, tournament organisers are aiming to draw in record crowds, with the men’s, women’s and wheelchair competitions staged in a single, celebratory event.